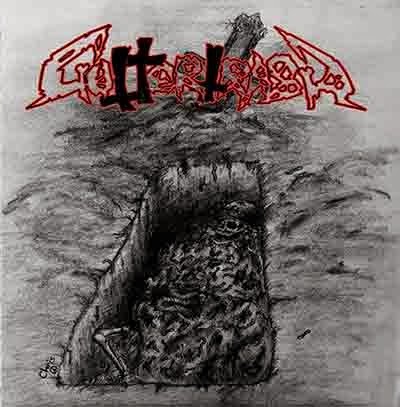 Guttertrash is a thrash metal band based in Greece. Behind the music there is only one man and he is talented! Playing a style of thrash with black and death metal influences, the demo makes for a very interesting and fun listen, although it is quite short and leaves you wanting more. The music has the energy that any thrash metal band goes out to capture, pure testosterone-fueled rage. Fortunately, there are enough influences from different styles of music which helps keep the music from falling into a groove and becoming stale. The music sounds heavily influenced by the first wave black metal bands, along with early death metal bands. The power behind each of the four tracks on the demo is top notch. It really grabs the listener by the balls (metaphorically speaking, for all the lady thrashers out there) and drags them along for the ride, swinging them around wildly until they can’t take it anymore. The production is amazing and the demo does not sound like a demo at all. Everything is crystal clear and all instruments ring through with their full potential. The drums are crushing and typically stick to basic, straight forward thrash metal chops. All parts of the kit are evident. Cymbals are as clear as the kick, making for a very full sound throughout the demo. The guitar work is quite similar throughout the songs. There is enough differentiation to make it interesting. The vocals are a very neat part of the demo. They are neither thrash metal nor first wave black metal styled vocals, they are more along the lines of lower black metal screams which changes the sound of the music immensely! One of my only complaints about this demo is that it is too short! In time, Guttertrash will hopefully release some more material because if this first demo is a sign of what is to come, we all better hope that we can hang on for one wild ride!